The Old Coach House is one of three properties at Hendra Barns resort, near the village of Mitchell, located close to Newquay and Truro in Cornwall. This holiday property offers relaxation with quality surroundings. The Old Coach House is ideally situated with the A30 only 2 miles away giving you the opportunity to discover Cornwall to the full. It is single-story converted coach house, and each of the bedrooms and living/diner opens onto the large, level garden. From the garden, guests can look over the grounds and lakes. Guests of the three properties have exclusive use of the 2.5 acres, including the lakeside arbour for evening dining and coarse fishing on the lakes. We have 5* excellent reviews on Tripadvisor. I have owned Hendra Barns for more than 17 years and over that time have put my heart and soul into this beautiful place. It has been a joy to work on these old buildings and bring them back to life. Hendra keeps me busy with the every day jobs. It's a pleasure as the setting is peaceful as well as relaxing, I am always around to ask advice as I live 200 yards away up the lane in Keepers Cottage. The Old Coach House will not disappoint you with it's walled garden and great views over the beautiful valley. It's spacious Living area and Kitchen. The bedrooms make for the perfect stay. I feel in love with it and it hasn't changed from the first time I saw it with all it's charm and character. The place will only have a good effect on you, if it's time to relax and soak up the atmosphere you be in the right place, Cornwall has so much to offer and it's all here in a short drive away but want to get away from it all then The Old Coach House is the perfect spot for you. En-suite bathroom offers wc with shower on a king size bedroom. Main Bathroom has wc, bath with shower. The living space is a good sociable space offering a log burner for those chilly nights. French doors onto the walled garden and patio ideal for eating out or just relaxing on the lawned areas. 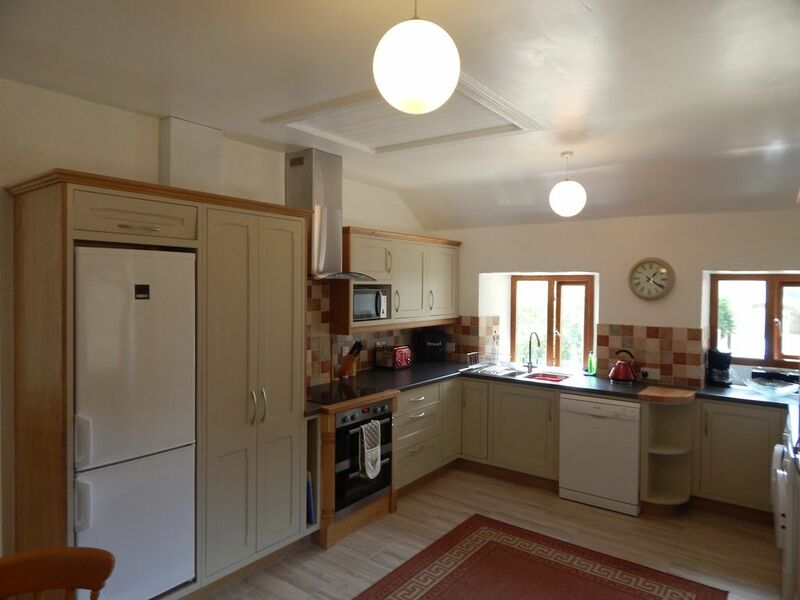 The Kitchen is large and has a dining table and chairs set within it, there is plenty of work space and cupboards. It is well equipped and has a tiled floor and spas back. The windows are south facing. There are a number of good golf courses in the area. Notes on accommodation: The accommodation is suitable to families and small groups as there are many good sociable areas to enjoy your holiday. The situation is peaceful and you have access to the Grounds and lakes though the garden door. If you would like to have a go at coarse fishing guests are welcome to fish the lakes here at Hendra. Outside: This Holiday home is situated in the country side and offers beautiful views as well as a sheltered garden to relax in. There are 2 patio areas and we offer a barbecue for outdoor entertaining. If you enjoy walking there are a number of footpaths on Hendra for you to discover this beautiful county. Cleaning / Towels / Linen / Maid service: Luxury towels and linen is provided. A lovely place to stay. Ken very friendly and helpful. Close to many local attractions. Beautiful scenery. A wonderful holiday destination for families and pets. Thank you for taking the time to share your experience Elaine, we'd love to welcome you back to Hendra Barns again soon. Hendra offers holiday breaks with courses on Cookery as well as Fly fishing and clay pigeon shooting, so if you want to have a celebration with a difference please contact us and we will be happy to help you organise your holiday. We are situated off the A30 only 2 minutes away and you have easy access to a large number of beaches near by only a car drive away. Trispen is the nearest shop and post office. Booking Notes: Please contact Hendra Barns with initial enquiry. Bookings are confirmed with a 30% deposit, and the balance is payable 30 days prior to arrival. Bank transfers are preferred. Changeover Day: Saturday (4pm) to Saturday (10am). Notes on prices: There is a charge of £25 per pet per week.